Christmas holidays are fun; we get to celebrate the birth of our savior and hang out with family and friends that we don’t get to see very often. It seems like every time families get together there is someone new in the family. Someone has a new baby, a recently married cousin brings their spouse to the family get together; or if there is a newly engaged member of the family, they bring their soon to be spouse, and there is always that one uncle that will try to intimidate them just a little. Decorations are another part the the holidays. My grandmother, before her health problems, decorated her house inside and out every year. I’ll never will forget the year that my cousin and I helped put up the large sign beside the house that read “Jesus is the reason for the season.” The sign had holes drilled in the letters so lights could be placed through them and it could be read ever on the darkest night. The problem was that about half of the lights didn’t light, so we spent most of the time trying to find that one small bulb that was causing the problem. I drive through the small town of Woodstock, Georgia very often and this time of year reminds me of a couple things that really bring a smile to my face. 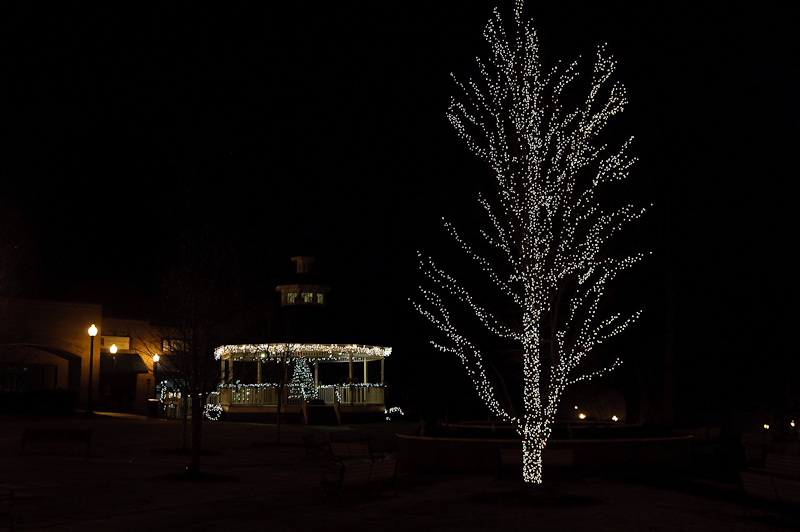 The City of Woodstock decorates the park and the gazebo where Jamie and I were married, with lights (see photograph below). The lights remind me of my family and that time at my grandmother’s house looking for that single pesky blub, and I get to remember the day that I married my best friend and we started a new journey together. Thankful for the memories that the holidays bring.